Remote power reboot, switching, metering and alarming via IP, RESTful API, SNMP, web interface, telnet, modem or local terminal to keep critical network elements running 24/7. Remote reboot your critical equipment! Remote power reboot, power metering & alarming via IP, SNMP, web interface, telnet, modem or local terminal to keep network devices running 24/7. 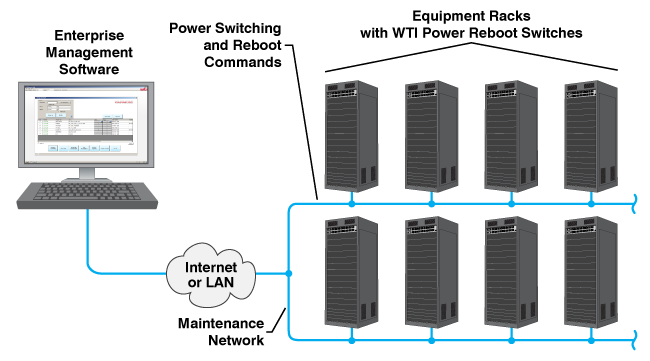 Network equipment such as servers, routers or firewalls sometimes "lock-up", often requiring a service call to a remote site just to flip the power switch to perform a simple reboot. Don't lose time, money or sleep over mission critical equipment, WTI remote power switches can help you control & meter power to your network devices. In order to prepare for the upcoming switchover to IPv6 protocol, all WTI Power Reboot Switches now provide full support for both IPv4 and IPv6 (the intended successor to IPv4.) This helps to ensure that WTI Power Reboot Switches purchased today will be fully compatible with the planned IPv6 internet environment, and will not be rendered obsolete when the IPv6 protocol eventually becomes the new worldwide standard for network communications. All WTI power reboot switches include WTI’s convenient Enterprise Management Software, which drastically simplifies the task of managing multiple power reboot switches spread throughout your network infrastructure. The WMU Enterprise Management Software provides a centralized command interface that allows administrators to easily manage, label and control multiple WTI power reboot switches in large network applications, reducing the time required to access power reboot and power switching functions on connected devices. Once installed on your PC or laptop, the Enterprise Management Software can search a user-defined IP address range on your network and discover all compatible WTI devices within the range. Discovered devices are then added to the Enterprise Management Software’s inventory, allowing administrators to assign a descriptive tag to each power reboot switch in order to denote the location or function of the device. In addition to providing a centralized interface for invoking power reboot and switching functions, the Enterprise Management Software can also be used to control firmware updates for WTI products and edit and manage user accounts at individual or multiple WTI devices. Now with Cisco® EnergyWise! Power control & meter per outlet for detailed kWh kW amps volts & temperature reporting. Our VMR-Series outlet metered power switch can help you keep an eye on your data center. Reboot outlets when an attached device ceases responding to ping commands, disable outlets to reduce current consumption or automatically shed power loads on less critical devices to protect circuit breakers. Looking for entry level power reboot switches that won't break the bank? Our IPS-Series power reboot switches are ideal for those who simply need to reboot network equipment in local or remote locations. With network grade security features and easy scripting capabilities, our basic power reboot switches are designed to get the job done at a great low price. Need to monitor and power reboot blade servers or Catalyst switches? Monitor and reboot your heavy power load devices with select models of our MPC Series branch metered + PDUs. Cycle power on C19 or C13 outlets powering your blade servers or chassis as well as Cisco Catalyst switches. For -48V DC equipment that locks up, requiring a service call or site visit to reboot, the RPC Series -48V DC power reboot switches allow you to reboot DC powered devices via web browser, telnet or external modem. Looking for entry level power reboot switches that won't break the bank? Our NBB-Series power reboot switches are ideal for those who simply need to reboot network equipment in local or remote locations. With network grade security features and easy scripting capabilities, our basic power reboot switches are designed to get the job done at a great low price. Now with Cisco® EnergyWise! Smart Power Reboot Switched PDUs with Individual Outlet Control & Rack Mount Power Distribution for kWh kW Amps Volts Temperature Reporting. Local digital LED and audible alarms will also let you know when current levels are about to trip built-in circuit breakers. Loads of other features make the MPC Series a must have box for those who are serious about controlling power on their network.